In the Aquino era, the focus was on financial flows, which rested on a strong peso. In the Duterte era, it is on the huge investment drive, which can live with a weaker currency. The peso’s political economy is shifting. I take a closer look at contradictory media reports about peso fluctuations, the Aquino years and the Duterte era and the shift toward a new peso political economy - and what's ahead. In the Aquino era, the focus was on financial flows, which rested on a strong peso. In the Duterte era, it is on the huge investment drive, which can live with a weaker currency. The peso's political economy is shifting. Recently, international media have released contradictory peso reports. But the phenomenon is not new. For instance, Bloomberg's Ditas Lopez first attributed the peso's decline to Duterte two months before the actual election (April 27, 2016). Yet, after the election, the peso rose for weeks beating forecasts so that by late August 2016 even Bloomberg had to admit that the currency had completed the "best performance in Asia this month." That performance was mainly the net effect of a Duterte reassessment by the markets. Most media had vilified him as a threat (social media was a different story). But as Duterte launched his infrastructure agenda, observers realized that the country was not facing a "populist threat," but a huge investment drive. Yet, historically, infrastructure drives favor weaker currencies; a fact that got lost in the translation. Instead, much of the media, including Lopez, continued to lament that "Duterte's peso rout runs counter to the booming Philippine economy" (September 29, 2016). The assumption was that a thriving economy must go hand in hand with a strong peso and that if this is not the case, then the economy cannot really be booming. Perhaps that's why Bloomberg later declared that "Asia's ugly duckling of the year Is the Philippine peso" (March 2, 2017). Unfortunately, the facts told a different story: the peso erased the year's loss as funds snapped up local stocks only a month later. That did not convince Lopez who now reported that peso is seen as "Asia's worst performing currency next year" (December 22, 2017). Once again, peso was seen amid another "rout" (June 20, 2018). The same story prevailed in early 2019, when Bloomberg reported that "peso faces new threat as Duterte gears up for poll" (January 7, 2019). With U.S. dollar at 53 peso, Lopez saw the peso among Asia's biggest losers this year. Yet, it was followed by a very different piece, which was not authored by Lopez, but David Finnerty, Bloomberg's foreign-exchange strategist who reported that "peso surprises to become Asia's best currency" (March 3, 2019). By then, the peso had strengthened to 52. Yet, only hours later, Lopez, together with Siefrid Alegado, reported that "peso slumps as Philippines makes surprise Central Bank pick" (March 4, 2019). In this view, peso had plunged "most since 2013," although the exchange-rate was 52.20. As the peso has varied around 0.2% to 0.9% in the past two months, it may be prudent to ask whether such variation merits characterizations as "Asia's biggest loser" or "Asia's best currency." Short-term fluctuations and ideological preferences of "strong" or "weak" peso seldom disclose long-term trends. In reality, the underlying longer-term forces behind the short-term peso fluctuations seem to be structural. What we are witnessing a shift from one Philippine peso regime to another. Here's the great difference between the Aquino and Duterte governments: In the Aquino era, the early promises to change the foreign direct investment (FDI) legislation paced an increase of capital flows in the early 2010s. 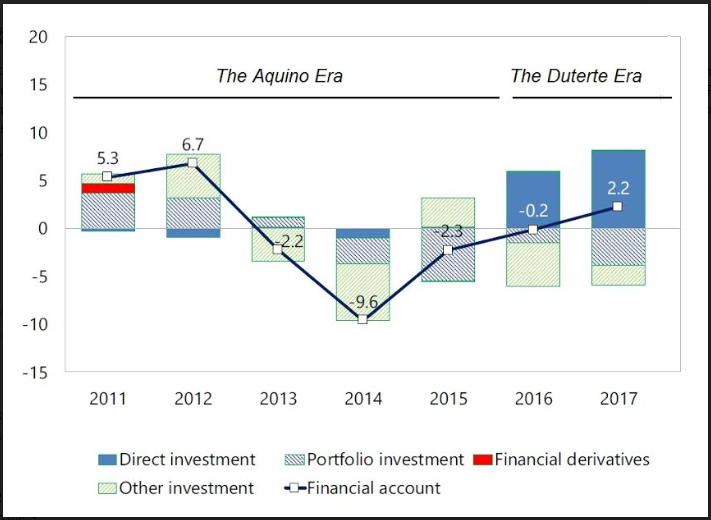 But since the Aquino government failed to change the FDI legislation, these flows represented mainly portfolio and other investments, which eventually reversed into significant outflows. In the Duterte era, early optimism and promises to bring in more FDI have paced a dramatic increase of capital flows, which could be sustained until early 2020s (Figure 1). When inflation reached an intolerable high of 6.7% last fall, it was boosted by a price effect associated with tax reforms, rising oil prices and a failure to manage rice prices. The slowing international economy penalized crude oil, which exceeded $75 in early October but is now around $56 (although a U.S.-Sino trade compromise could fuel prices again). When inflation exceeded Philippine central bank's (BSP) target range, rate hikes followed; belatedly. In the early Duterte era, interest rate had been cut from 4% to 3%, which prevailed until early 2018, even as peso weakened from 47 to 50 in 2017 and to 52 by early 2018. It was only when the rate hikes hit almost 5%, that inflation declined and peso strengthened to 52 (Figure 2). Overheating is expected to weaken in 2019. Thanks to government measures to promote food supplies, inflation eased to 4% in February. Higher real yields are supporting the peso government bonds, despite the BSP projection that the current account deficit (CAD) could widen to 2.3% of GDP in 2019. In the past, the quota system failed to keep rice price in control; now the new import tariff system should stabilize it. The slowdown of electronic exports, which account for more than half of Philippine exports, is associated with U.S. trade wars. One reason for the contradictory peso projections by the media is that they misjudged the succession outcome at BSP. After the premature death of Nestor Espenilla, the potential candidate list by Bloomberg's Lopez and Alegado featured some 10 insiders, private-sector executives and wild cards - but not the next chief of the Bank. In a shrewd move, Duterte named his budget secretary Benjamin Diokno as BSP's new chief. In the government, Diokno had pursued an expansionary fiscal policy to finance infrastructure investments, along with Duterte's financial chief Carlos Dominguez III. In the coming months, Diokno might lean toward an interest-rate cut, but only as long as it can be justified with easing inflation. Some observers feel uncomfortable with current account deficit. Yet, the widening CAD is the effect of the infrastructure drive, which requires imports that support infrastructure expansion. Yet, despite the CAD, peso proved Asia's best-performing currency in February, when it was fueled by the record $2.9 billion of remittances in December. Also, foreign investment into Philippine stocks and bonds recorded a net inflow of $763 million in January; quadruple the level of the previous year. Most currencies in emerging markets have depreciated with the U.S. Fed's rate hikes. But as U.S. expansion may have peaked, the Fed seems less hawkish. Yet, peso outperformance may not persist, thanks to the extremely challenging international environment. The Duterte fiscal expansion has potential to continue well into the early 2020s - as long as international headwinds can be kept at bay.